(Newtown, PA – January 26, 2017) – CenTrak®, healthcare’s leading provider of Enterprise Location Services™, announced today the launch of Edge™ – a program that empowers healthcare providers to maximize the financial and clinical benefits of CenTrak’s Real-Time Location System (RTLS). Through its extensive partner ecosystem, Edge emphasizes the importance of an open location platform enabling the integration of existing legacy applications and new RTLS focused solutions. Edge provides healthcare leaders with enterprise-wide location data which can be used to make well-informed decisions for their patients, staff and bottom line. Offering the benefits of a unified service delivery model, Edge is managed through highly qualified Systems Integrators and provides healthcare facilities access to over one hundred and thirty (130) certified Solution Providers. The program was founded on flexibility – enabling end-users to maintain focus on use case prioritization and value documentation. The comprehensive suite of services offered via Edge includes deployment services, device management, and success management. With the help of Edge, St. Joe’s offers several patient experience enhancements that make up its Intelligent Care System, whereby multiple applications are integrated together to enhance healthcare delivery, efficiency and quality. St. Joe’s leverages Enterprise Location Services to stream location and sensory data to their clinical applications. 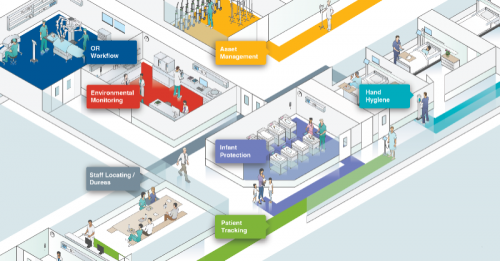 The hospital also has integrated CenTrak’s Enterprise Location Services with Nurse Call, Patient Education, Smart Room, and Hand Hygiene Compliance Solutions. The most recent integration utilizes CenTrak Single Use Patient Tags to stream real-time updates of patient location to St. Joe’s capacity management system. CenTrak improves healthcare operational efficiency and patient care quality via the industry’s most robust and scalable Enterprise Location Services™ offering. CenTrak’s technology supports high velocity updates and sub-room level accuracy across the entire healthcare enterprise. CenTrak’s Real-Time Location System (RTLS) has earned KLAS’ highest overall performance ranking. A Deloitte Technology Fast 500 fastest-growing company for three consecutive years, CenTrak helps world-class healthcare facilities increase productivity, streamline workflows, drive higher patient and staff satisfaction and reduce costs. For more information, visit CenTrak.com. St. Joseph Mercy Oakland is a 443-bed comprehensive, community, teaching hospital and a long-time leader in health care in Oakland County. Founded in 1927 by the Sisters of Mercy, St. Joseph Mercy Oakland has won numerous local and national awards for patient safety, quality and performance, and consistently ranks in the top 10 percent of hospitals nationwide. A member of the Saint Joseph Mercy Health System, St. Joseph Mercy Oakland is a technologically leading hospital that combines advanced medicine and personal care to assist patients on their path to wellness. With dedicated physicians, nurses and hospital staff committed to providing quality care throughout the patient stay, St. Joseph Mercy Oakland has truly personalized the patient care experience. For more information about health services offered at St. Joseph Mercy Oakland, please visit stjoesoakland.org. Saint Joseph Mercy Health System (SJMHS) is a health care organization serving seven counties in southeast Michigan including Livingston, Washtenaw, Wayne, Oakland, Macomb, Jackson, and Lenawee. It includes 537-bed St. Joseph Mercy Ann Arbor, 443-bed St. Joseph Mercy Oakland in Pontiac, 304-bed St. Mary Mercy Livonia, 136-bed St. Joseph Mercy Livingston in Howell, and 133-bed St. Joseph Mercy Chelsea. Combined, the five hospitals are licensed for 1,553 beds, have five outpatient health centers, six urgent care facilities, more than 25 specialty centers; employ more than 16,200 individuals and have a medical staff of nearly 2,700 physicians. SJMHS has annual operating revenues of about $1.9 billion and returns about $120 million to its communities annually through charity care and community benefit programs.